It's been a couple of days since "the botch". For us fans, as we all return to our daily lives and face the bitterness of getting grief from all of the Sparty fans we know, all of the time-honored tough loss phrases are being put to use. "Time to move on and put it behind us." "Still plenty of season left. It's just one game"
"Such a fluke. Mistakes happen." "We played good enough to win the game." All of those things are fine and good. I mean, for us fans, it's just a game. And even for the players, with 5 more games on the regular season schedule, most will be able to shake off this loss and move on. That is, except for one guy. Blake O'Neill, the 22-year old Australian-born graduate transfer from Weber State, playing in his one and only season as a Wolverine...will have to live with this game...this singular moment, for the rest of his life. It's doubtful that he'll be remembered, by most folks, for anything more than just this one play. For the rest of us, that's tough to imagine. We all have our lives...our jobs and our friends and families to focus on. We all got to do something else on Sunday...and today and tomorrow. But for Blake, all he got to do was relive what has to be one of the worst moments of his life. It's likely a moment that he will replay in his mind over and over again. Imagine your worst moment live on national television and in front of 111,000 people...some of which got to celebrate your mistake right in front of you as it happened. Simply brutal. I can't even begin to imagine how hard it was for Blake just to wake up yesterday. You hear it all the time though, when things like this happen..."It's the life of a kicker. You're either the hero or the goat". Even punters know the feeling as sometimes there's just as much riding on their foot as a placekicker...as former Michigan punter Will Hagerup described via his Facebook on Saturday night. "You just saw first hand that punting is really hard. I challenge anyone to go catch a snap in 30-degree weather with 100,000 people watching. He had a terrific game and put our defense in great field position multiple times." And really, Blake O'Neill did have a great game. His 80-yard punt in the 1st quarter was a thing of beauty. It completely flipped the field and pinned MSU back enough to make their ensuing 70-yard drive result in 0 points. His 3 other punts inside the 20 are the definition of just how you win games like this with special teams. O'Neill did more to help Michigan on Saturday than he did to hurt them. There were many opportunities for the offense or the defense to pick up the slack and they simply didn't get it done. Michigan left points on the field on Saturday. Michigan wins as a team and loses as a team. It's not fair for O'Neill to shoulder all the blame for this one. But sometimes blame isn't exactly fair. The outpouring of support from the entire Michigan football community, including Michigan interim AD Jim Hackett, has dwarfed all the negative or hurtful comments O'Neill has received since Saturday night...though the idiots are the ones who usually make the most noise. I won't post any of the vicious and hateful comments that I've seen...you don't have to look far to find those. Instead, I want to focus on the positive and supportive comments that have far outnumbered the awful ones. "(Told him) just keep his head up. I left plays out there myself I could have done better. We've got to execute better offense, defense and special teams wise." We stand united by our motto The team, The team, The team. No one play defines us but it certainly fuels us! We believe! We own it. Move on! "I talked to him, I just told him we're behind him. We support Blake through everything, and that's the kind of team we're going to be." @blakewoneill God puts adversity in r lives for a reason. Stand tall, close your ears to opinions from outside & be strong. You are good! @blakewoneill keep your head up. You're our guy! "I have empathy for that because we've been on the other end of that stick as well before," he told host Matt Shepard on WDFN-AM (1130). "I don't know that it's my place to reach out. I will say this: This is a game. This is the entertainment business that we're in. People come to watch, to have a great time with their family and their friends, and to enjoy completion at its highest level, and I think that's what they saw: competition at the highest level. "After it's done, all I ask our players to do is do the very best they can and afterward we try to pick up the pieces and try to get better. But it is a game and other people need to realize that. It's difficult to hit (the spot of a) golf ball and it's much more difficult if 11 guys are running at you. So take a picture of that and try to frame that for a lot of people. Yeah, I think it's unfortunate and, hopefully, people will let that go and the young man will get on with his life. He did a great job other than that one play. And outstanding job." I've been covering Michigan football since 2007 and have been a fan since way before that. And all I can add to this outpouring of allegiance for O'Neill is just to say that he has more support from the Michigan football community than he can possibly imagine. 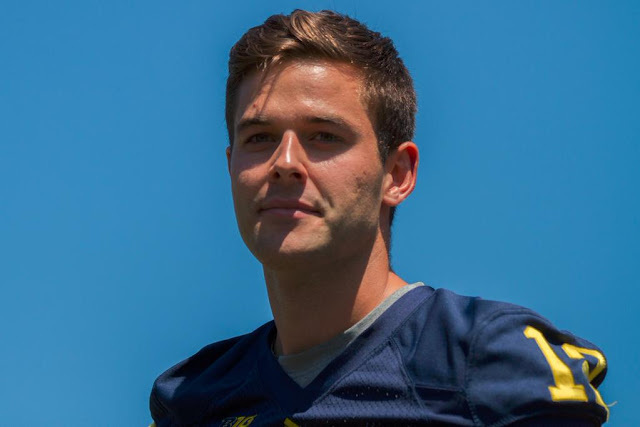 He's only our punter for one year, but he's now a part of the Michigan family and that's never going to change. Keep doing what you're doing Blake. Go Blue!